This fairy figurine is based on artwork by Amy Brown! It features a pixie with a bit of an attitude. The fairy sits upon a mushroom, wearing a tan outfit and stocking striped with white and black. The fae's wings are done in shades of earthy brown, and match her auburn hair. Underneath her seat are more little toadstools. 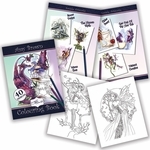 This unique collection is sure to bring a smile to any faery lover's face!